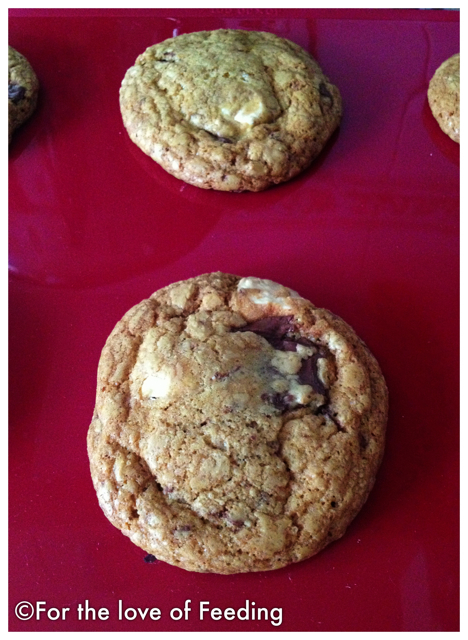 The cookie monsters are back! 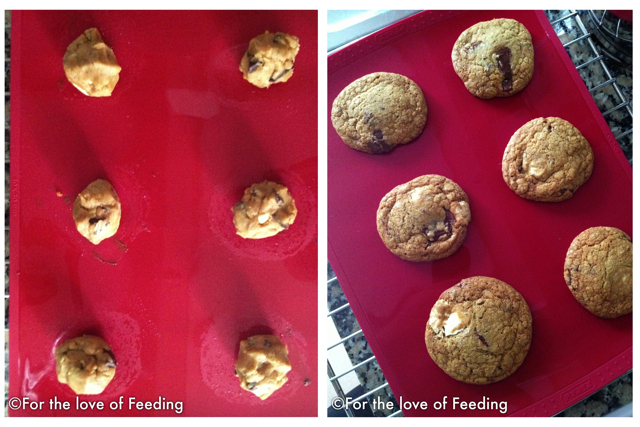 And this is very true, considering the time a batch of cookies lasted in our home: 3 days. 2 people. Testament to how awesome they were! This was the first time I tried browning the butter. I was always thinking that it cannot make such a big difference. Boy, was I wrong! It definitely makes a difference! The taste and smell are incredible! Put the butter in a small pot or pan and let it melt on medium heat. Once it melts it will start boiling and bubbling. Stir it often. Then it will start becoming darker and you will notice some pieces precipitating on the bottom. Stir more often and do not leave it unattended because it burns very fast. Once the color is deep brown remove it from heat. 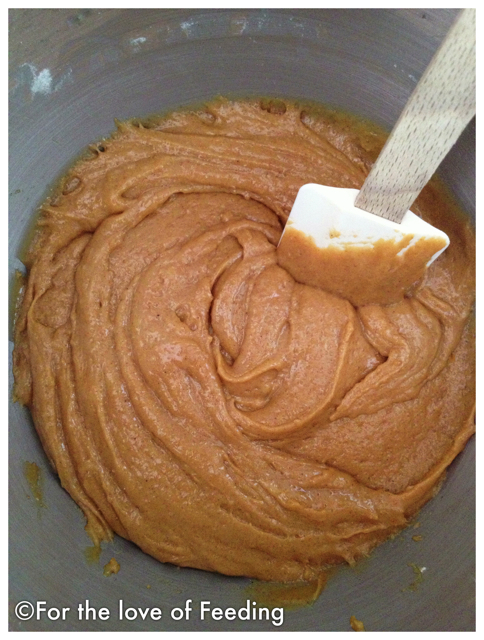 Place the sugar and the browned butter in a large bowl (stand mixer or hand mixer) and beat until creamy. Add the eggs and vanilla and beat again. Slowly add the flour (previously mixed with the baking soda, cinnamon and salt) mixing with a spatula. 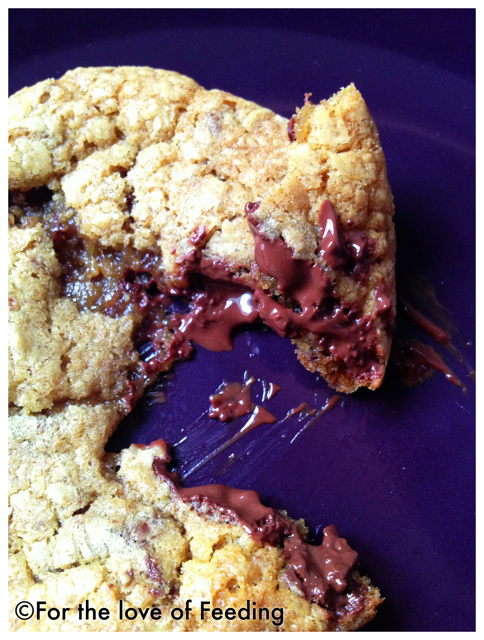 Chop the chocolate bars and mix them in the cookie batter. At this point I placed the dough in the fridge, just because I did not have time to proceed immediately. I left it for 1h. You can leave it for more if you wish (1-2 days). Place almost 1½ tablespoon (or like a generous tablespoon) of dough on a baking tray lined with parchment paper or baking mat, leaving around 5cm (2 inches) space between cookies. Bake for 12min. This is just enough for the outer part to brown. Remove from the oven and let them sit for some minutes on the tray. Pick them carefully with a spatula and allow them to cool on a wire rack. And you are the proud baker of delicious cookies! And don’t listen to what people say about cooling them etc… Just take one, break it as it is warm and soft and oozing chocolate and enjoy a heavenly treat! Preheat the oven to 180ºC (350ºF). Put the butter in a small pot or pan and let it melt on medium heat. Once it melts it will start boiling and bubbling. Stir it often. Then it will start becoming darker and you will notice some pieces precipitating on the bottom. Stir more often and do not leave it unattended because it burns very fast. Once the color is deep brown remove it from heat. 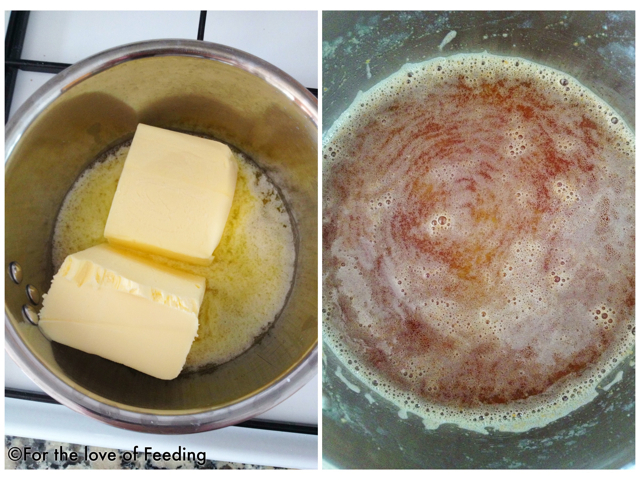 Place the sugar and the browned butter in a large bowl (stand mixer or hand mixer) and beat until creamy. Add the eggs and vanilla and beat again. Slowly add the flour (previously mixed with the baking soda, cinnamon and salt) mixing with a spatula. 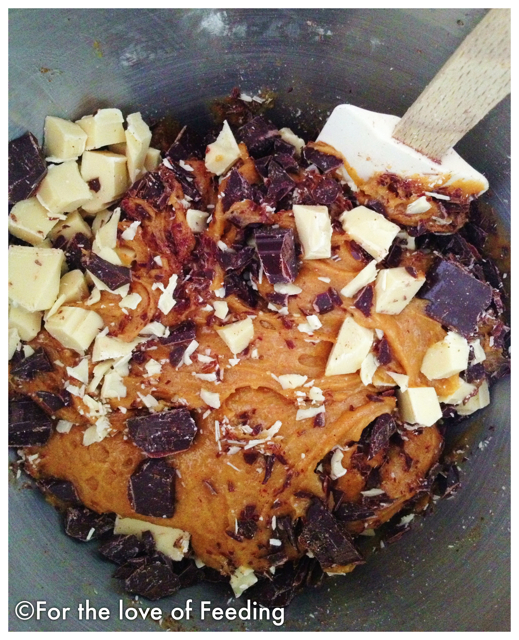 Chop the chocolate bars and mix them in the cookie batter. 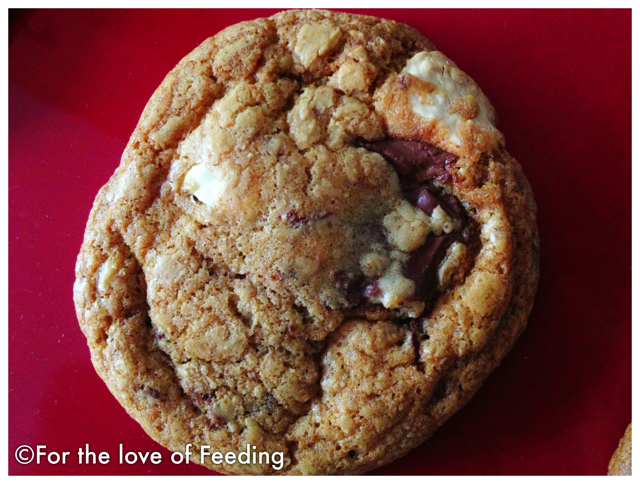 (At this stage you can leave the cookie batter in the fridge for 1-2 days if you wish). Place almost 1½ tablespoon (or like a generous tablespoon) of dough on a baking tray lined with parchment paper or baking mat, leaving around 5cm (2 inches) space between cookies. Bake for 12min. This is just enough for the outer part to brown. This entry was posted in Cookies, Desserts and tagged brown butter, chocolate, chocolate chunks, cookies, dark chocolate, white chocolate on May 23, 2013 by Villy. Η αλήθεια είναι ότι έχω δει αρκετές συνταγές με “brown butter” αλλά δεν έδωσα ιδιαίτερη σημασία καθότι δεν φαντάστηκα ότι θα έχει κάποια διαφορά! Τα μπισκοτάκια σου φαίνονται άπαιχτα! Έχουν και δύο είδη σοκολάτας που τα κάνει ακαταμάχητα! Και όμως, και μόνο η μυρωδιά όταν αρχίζει να ψήνεται το βούτυρο είναι απίθανη! Ευχαριστώ Ερμιόνη! Καλο ΣΚ! 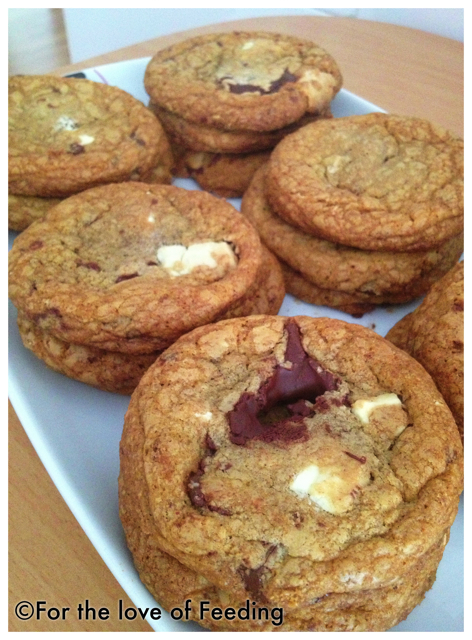 I haven’t tried baking brown butter cookies, but I think I really should, these cookies look amazing and delicious, especially the shot on the oozing chocolate, irresistible! hope you will like it! Take care!